I was not going to leave Amsterdam without crossing off some of the local specialities off my list. Fries was not on my list, but since I didn’t know what I’d get in Brussels, I thought I’d try some here. 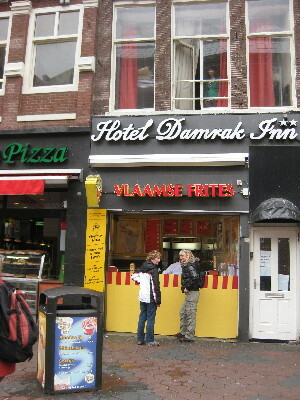 And a good thing, because the fries in Amsterdam are free to proclaim to the world that they are FLEMISH FRIES! Not French Fries! Definitely not Belgian Fries—the very idea! Nay, while there is a frying pan and some soggy mayonnaise to spread, the Flemish cause lives. Of course, this is gratuitously unfair; for all I know, fries were invented in Flanders before Belgium was a glint in the Duke of Wellington’s eye. But it was an obvious dig to make; and as far as I can tell, “Flemish Fries” is really what they’re called in Dutch (and not just in Flanders.) I wonder what the Walloons call them. Probably just pommes frites, and not, I dunno, frites de liberté or frites de flamandais maudits. The list of local specialities included Argentinian steak. For reasons I cannot fathom, Amsterdam tourist precinct is packed with Argentinian steakhouses. I wouldn’t have pegged Amsterdam for a big Argentinian community, and I don’t see that Argentinian steak is the best match for aromatic coffeehouse-induced munchies; but I counted at least seven Argentinian steakhouses. I had steak in the place I had my Sunday morning coffee and apple pie (La Gauch, just before Centraal Station); the minimum 200g fillet, because I don’t foresee a situation in which I could do anything constructive with a half kilo slice of cow. For an empty tourist joint, the steak was just fine. Not tender enough to scoop out with a spoon (as my friend Steve found a steakhouse showing off in Buenos Aires); then again, I’m not sure I’d actually want a steak that tender. But yes, quite tasty. Next on the list was jenever, the Dutch version of gin. You can get an Old jenever, which is yellow and mellow and not a Donovan song; or you can get a Young jenever, which is still working through its teenage rebellion. Since I had only 24 hours more in the Netherlands (of which most would be spent at the airport, asleep, or getting lost walking around town), I enquired whether a jenever might be possible from my Argentinian hosts. ME: Could I possibly have a djenever. HOST: A djenever. Or even a yenever. [looks around] I will get you one, sir. HOST: [Calls over waitress] Doordrecht Utrecht Rotterdam Leiden yenever. HOST: Amsterdam Groningen Nijmegen den Haag shop Arnhem Almere jenever! WAITRESS: Stuyvesand Leeuwenhoek Vermeer serve Rembrandt Tasman Dampier jenever? HOST: van Dijk van Diemen van Gogh van Morrison shot glass Amstel Rijn Flevoland customer Poffertjes Clogs jenever! As a result, I had before me a clear glass of young jenever, next to my pepper sauce and steak. This was a quite young jenever. Young enough that it should have been grounded. Young enough to crash its car in my gullet and do a runner. Interesting experience. Not a million miles away from my grandfather’s moonshine grappa, but with juniper flavouring going on. I didn’t get to have Rijsttafel, or to reach a more mature evaluation of the history of Dutch colonialism. I struck up a great conversation on the train back from Amsterdam with a Turkish linguist at the Max Planck. (My thesis came in handy: I’d at least heard of a few more Turkish towns than average.) She actually mentioned that they were having Rijstafel at her place that evening, but I already had a date with Argentinian cuisine. The waitress was slightly surprised at my request for stamppot, which was on the cuisine régionale nederlandaise menu outside but not on the lunch menu inside. She said (not sure whether in Dutch or English) “I will get you some”. I’m pretty sure she didn’t run around to the corner bottle-o to do so. A quarter hour later, I was about to peruse the afternoon papers, to see whether I could guess the meaning of Dutch in newspapers as well as I could on cigarette packs, when my stamppot arrived. With a server so surprised at the request, that he gave me a 30-second disquisition on stamppot and its social setting. SERVER: Here is your lunch sir. It is a heavy lunch. 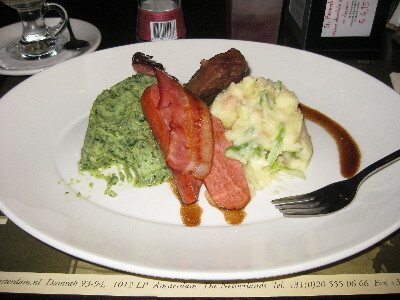 This is stamppot: this is mashed cabbage, and this is mashed potato and lima beans, with bacon and sausage and beef. It is what we eat in January, when it is really cold outside; so we eat it after we go out skating. ME: Well, unfortunately I could only get here in March. SERVER: Oh, no problem sir, we serve it all year round! But not to many tourists, I suspect. And you know, it was a heavy lunch. Definitely comfort food, and the cabbage-based mash was surprisingly pleasant; but you wouldn’t want to eat it every day. Unless every day involved skating, I suppose. Lunch was accompanied—because I like to try anything once—by Dubbelfriss and Amsterdam koffie. Dubbelfriss was a European-sized helping of lolly water. It was friss because it was fresh (and Friesian). It was Dubbel because it mixed two flavours of lolly: I got raspberry/cranberry. 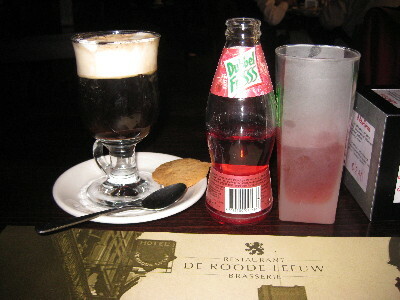 The Dutch for “raspberry” is framboos, which is somewhat reminiscent of the French framboise. The Dutch for “cranberry” is cranberry, which is somewhat reminiscent of globalisation. The Amsterdam koffie did not my knowledge involve anything served in aromatic coffeeshops. It was coffee, full cream (again with the cream), and honey liqueur. Definitely liqueur and not just honey. I’m pretty sure the base coffee was Douwe Egberts too (or as I have mangled it at least once, Doogie Engelbarts); so heavy vanilla substrate to the cream and mead. Yes, I approve. Back to diet next week, I know. Cranberry, by the way, is some kind of Continental Low German(ic), in which it is transparently 'crane-berry'. Vaccinium oxycoccos grows in England too, where it was historically known as fenberry and marsh whortle/huckleberry, but the English settlers in North America picked up their Low German(ic) neighbors' word, which eventually took over in England too. And that's why cran- is a cranberry morph — because cranberry is a borrowing. So the globalization for once went the other way, from Dutchistan to North America. For the spelling, see my 2009 comment above. I have traveled to Argentina and I have stayed in Buenos Aires, near the river. The place where my buenos aires apartment was is called Puerto Madero, and it is very similar to Amsterdam. It surprise me. Q: What’s the difference between Dutch and Flemish culture? A: The Flemish spell it kultuur so as not to be too French, whereas the Dutch spell it cultuur so as not to be too German.